Since joining Stampin' Up! just over a year ago, I have had the most amazing journey! I get to share what I love to do with amazing friends. Last Sautrday was my opportunity to give that back to the wonderful Ladies that have supported me, in the form of a Hostess Appreciation Workshop. We had a fantastic turn out, even thought the weather was atrocious! But what better way to spend an afternoon, than crafting with friends! Everyone got to make two Make & Takes using some of the gorgeous new product from our 2010/2011 Catalogue. The Big Shot machine got a really good workout that afternoon! We had a lovely Sausage sizzle for lunch, thanks to my darling husband! Not a crumb was left for the birds! The ladies really needed to keep up their strength while pouring over the new Catalogue and checking out the huge display I had set up for them to look at. I made sure that everyone was kept busy and had plenty of give aways for them to enjoy too. 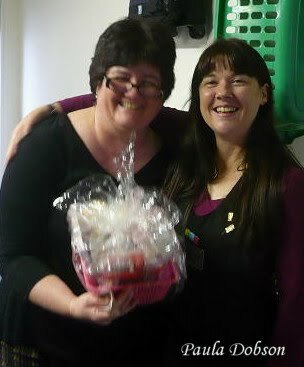 A BIG Congratulations to Tina for winning the Grand Prize draw. I hope you find plenty of things in the basket to inspire you Tina! Thank you to everyone who came along for the afternoon! I thoroughly enjoyed the day and the company. You guys all ROCK!! Hey Paula, looks like you all had a great day. Congrats of a great day.